Freddie Mercury is best known for his glittering career in music, touring the world as the charismatic lead singer of Queen. However, shortly before he was jetting between arenas, Freddie worked as a baggage handler at Heathrow Airport; ensuring a smooth flight for passengers who would later become adoring fans. He joined Queen in 1970, making history and ultimately becoming an icon of modern music before his death in 1991 at the age of just 45. And the staff at Heathrow remain incredibly proud of one of their brothers-in-baggage who soared to dizzying heights of fame and renown. In celebration of ‘Freddie For A Day’ – marking the rockstar’s birthday on September 5 and upcoming music biopic Bohemian Rhapsody – British Airways and Heathrow Airport have given a remarkable tribute to the great man himself. 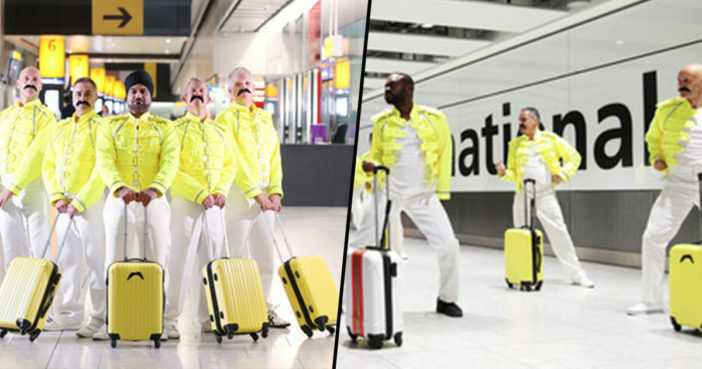 Baggage handlers worked alongside Strictly Come Dancing and X Factor choreographerLyndon Lloyd to bring a little of Freddie’s magic dance moves to Terminal 5, delighting passengers. This amazing stunt was possible after weeks of rehearsals, with the baggage handlers doing their former colleague proud. Freddie Mercury is an undisputed rock legend and it has been an absolute blast planning his birthday celebrations at Heathrow Airport, where he once worked. Myself and the other baggage handlers taking part have put everything into these dance routines and we can’t wait to see the faces on holidaymakers when they strut their stuff in the arrivals hall! The new film Bohemian Rhapsody has proved a great inspiration for all of us and we can’t wait to be hot-stepping our way to the premiere next month! What a magnificent tribute, and one I imagine the theatrical, phenomenally talented frontman would have greatly appreciated. You can catch Bohemian Rhapsody at UK cinemas nationwide as of October 24. The film follows Freddie’s journey to stardom, and even features scenes from his baggage handling days at Heathrow.